We had to move the rhubarb plant that had sprouted up in the back yard. It popped up a couple years ago and was right next to where the gardener guy burns the yard debris. Despite asking him to move where he does the burning he hasn’t. So this year we moved it to a safer spot so we could actually have rhubarb this year. 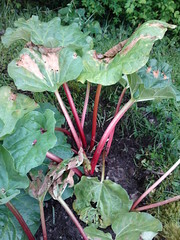 We also planted an additional rhubarb plant that we got from our next door neighbor. It’s a cutting from her lovely rhubarb plants. Hopefully it will grow nice and big like hers.